How many of you prefer natural pet products? As you know, we prefer using natural products in our household. Not only are they often better for the environment, but better for our pets. Not only do they contain the best ingredients, they encourage our pets to stay healthy and with us as long as possible. While natural treats and food are obviously my top priority, I also love when I can find high quality dog shampoo and natural cleaners for our home. During our trip to BlogPaws, we were actually introduced to a new company that focuses on natural pet products – Rocco and Roxie Supply Co. After learning a bit more about the company, we were excited to get a variety of complementary products to try for ourselves! Rocco and Roxie Supply Co: Who Are They? Do you love supporting small, family owned businesses here in the United States? If so, we think you will love Rocco and Roxie Supply Co. This family owned and operated business makes only the highest quality pet products here in the United States using the best natural ingredients. Each of their products are created with the health and comfort of pets in mind, creating products that every pet loves – guaranteed! They want you to have the same trust in their products as their own family pets and are happy to share their family recipes with the rest of the world! Are you trying to find an amazing shampoo for your dog? If so, we think you will love Rocco & Roxie’s line of shampoos, created to give your dog a full spa experience at home. Their shampoos are all designed to give your dog’s coat a beautiful shine and make all coat types look amazing using only the most wholesome, healthy blend of high quality ingredients. As well, their products never contain formaldehyde, parabens, artificial colors, dyes, mineral oil, phthalates, or isopropyl alcohol. They even have a care product that is perfect for a puppy’s sensitive skin. So far, I have to say that we are very impressed with their line of shampoo and conditioners. Their Shine Conditioning Shampoo left Ivi with the most beautiful, shiny fur. Best of all, her fur was soft, which meant even more cuddle time for our sweet girl. For Ivi, the best part was that it didn’t have a strong smell, allowing her to sit back and relax without going into a sneezing fit, unlike many other brands.For Rylie, we had similar results with their Calm Sensitive Shampoo. 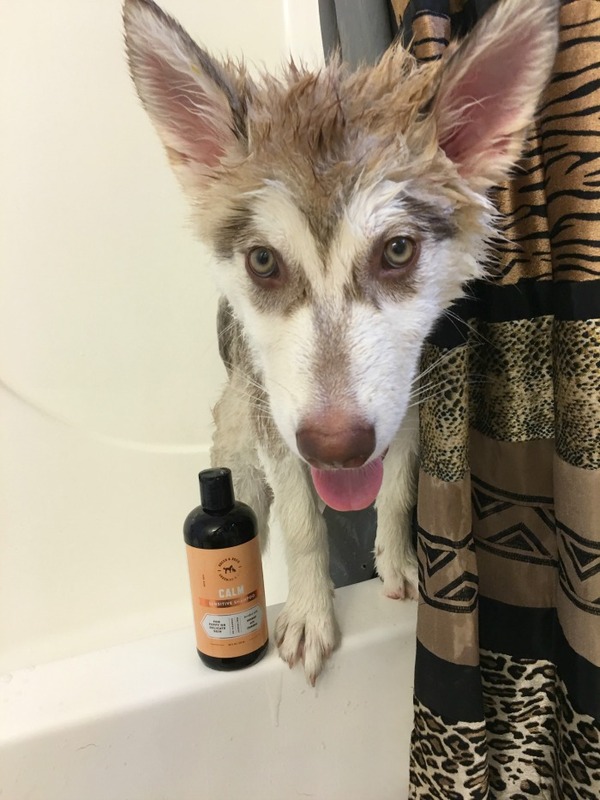 This shampoo is designed to be great for puppies or dogs with sensitive skin. With the soothing smell of the shampoo, Rylie puts up with the whole bath experience, especially since I can speed through the process with the concentration of their formula – a little goes a long way. In the end, she had the most amazing puppy fur that smelled amazing! Are you trying to find a pet cleaner that can get out even the toughest stains, including urine, feces, vomit, and other smelly organic stains? If so, we think you will love Rocco & Roxie’s Professional Strength Stain & Odor Eliminator. 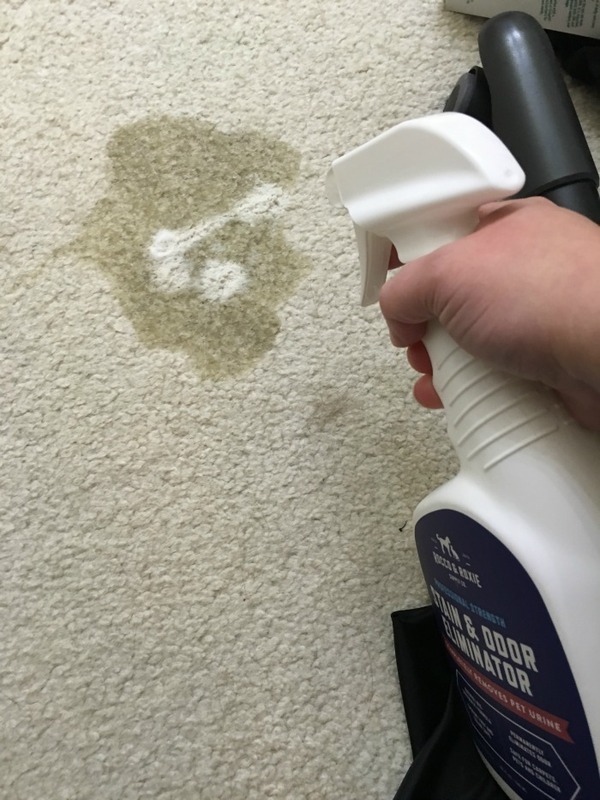 Their cleaner is designed to remove visible stains, and make odors disappear from carpets, rugs, or upholstery, or you get your money back! This pleasant smelling cleaner is formulated to be safe for children, pets, and the environment, and even has the Seal of Approval from the trusted Carpet and Rug Institute (CRI). Along with having a 100% money back guarantee, it is also made right here in the United States, making it the perfect choice for pet parents everywhere! While we haven’t had too many naughty spots to use the product on, we have had a few from the puppy. So far, it has done a fantastic job helping remove nasty potty stains and most of all, the odor. Even though the jury is still out and I want to do a bit more testing, I am impressed with the results so far! I also love that the girls aren’t too interested in the scent, letting me know the cleaner is doing its job. 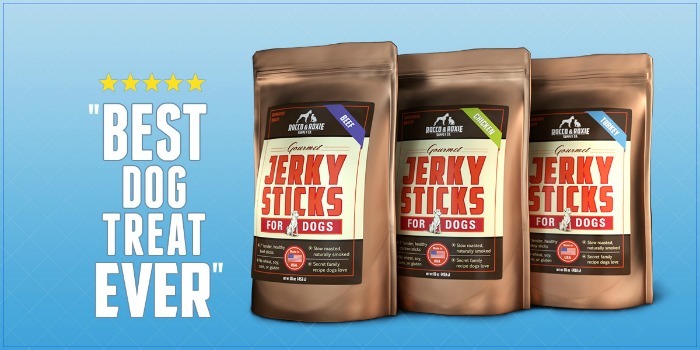 Looking for the best jerky treats for your dogs? If so, we think you will love Rocco & Roxie’s Gourmet Jerky Sticks. These low calorie, high protein jerky treats are made using high quality, All-American Beef, Chicken, or Turkey and have a smoky flavor dogs love, slow cooking for over 15 hours for the best texture and flavor to drive dogs crazy. As well, their family recipe includes never using wheat, corn, soy, or gluten fillers – only the stuff dogs love from American farms. Unlike other brands ,they are also perfect for training since they don’t leave behind a sticky residue, making them perfect for humans and dogs alike! Okay, I have to admit, this jerky is pretty amazing. When we opened the bag, the first thing we smelled is smoked chicken jerky. Not the cheap stuff, it smelled like good jerky you would expect to pay an arm and a leg for in most specialty stores for humans. As well, the jerky didn’t have that oily feel, making it perfect for breaking apart for training or just spoiling the girls. What really made everything worth it was when the girls first smelled this jerky. They were going WILD in hopes of getting some and were doing wild laps around the yard for it. Once they got it, both girls were protectively enjoying their pieces, making it clear to one another that these were not sharing treats! 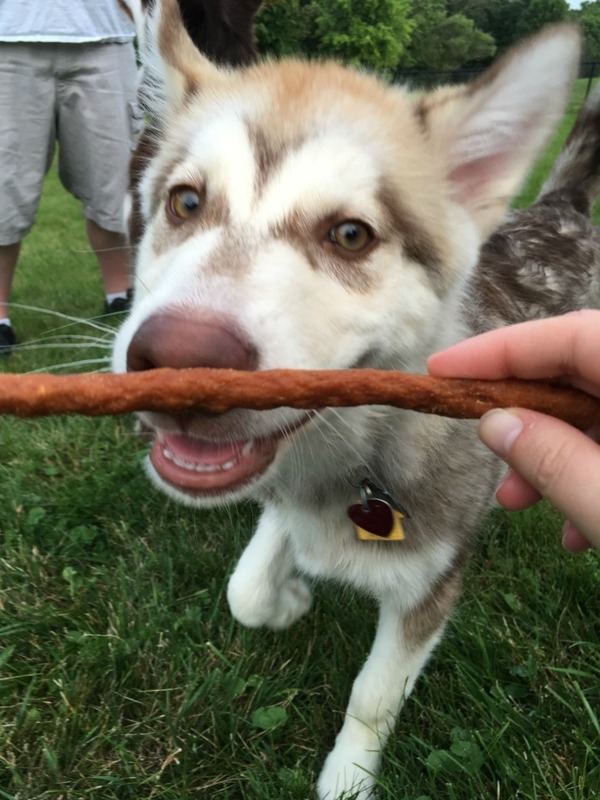 Trying to find an amazing treat that will drive dogs wild? If so, we think you will love Rocco & Roxie’s Gourmet Liver Treats. These treats are not just made in the USA in small batches, but made from only one high quality, all natural ingredient – beef liver. These treats have a natural, smokey flavor which comes from the treats being slow smoked for over 15 hours, creating a treat with a crunchy texture that dogs love. As well, Rocco and Roxie never add wheat, corn, soy or gluten fillers to their treats, making them as healthy as possible for dogs. One of the first things I noticed about the treats when we opened them was that they didn’t smell horrible. If you have ever opened liver treats, you know what I mean. It is usually a smell that only a dog could love and could easily turn my stomach. These smelled just like typical beef jerky and didn’t feel oily or nasty like most other liver treats we had tried. Of course, the important part was how much the girls loved these treats. While they don’t compare to the chicken jerky in their eyes, the girls still went crazy over the liver treats. 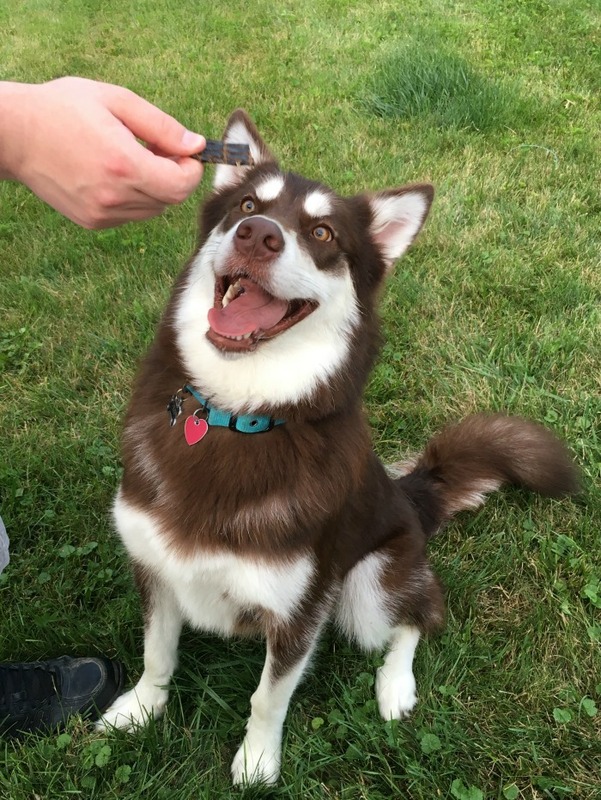 When they found out no more jerky was coming, they were happy to listen to commands and enjoy their new yummy treat! Rocco and Roxie Supply Co: Where to Purchase? Want to try some of the amazing products featured in this review? You can find all the products featured in this review on Amazon.com, most with free shipping. You can also find some of their products on the Rocco and Roxie website! Want to learn more? Check out Rocco & Roxie Supply Co on Social Media! Disclosure: Budget Earth did not receive monetary compensation for this review, but did receive products for review purposes. This post may also include affiliate links. All opinions on this product are my own honest assessment, and may differ from our readers’ opinions. Love that it’s natural. perfect for our dog! I love that it is natural and no harsh chemicals. Thanks for sharing these products. 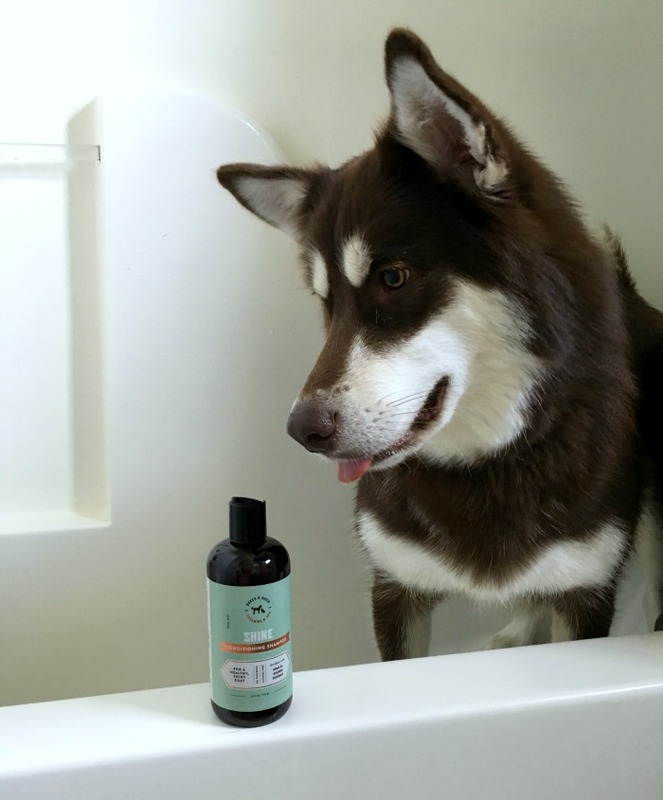 I love that they seem excited about the bath , and also I really love that they have a great product for cleaning up those messes, but also have such wonderful treats for well behaved dogs.. Treats that don’t smell are a plus! I’m always on lookout for safe shampoo for my dog too. I love the stain and odor eliminator.I will definitely try it.Thank you. My Yorkie could have used a natural calming remedy. He was always so anxious and shaking. These are great to try. 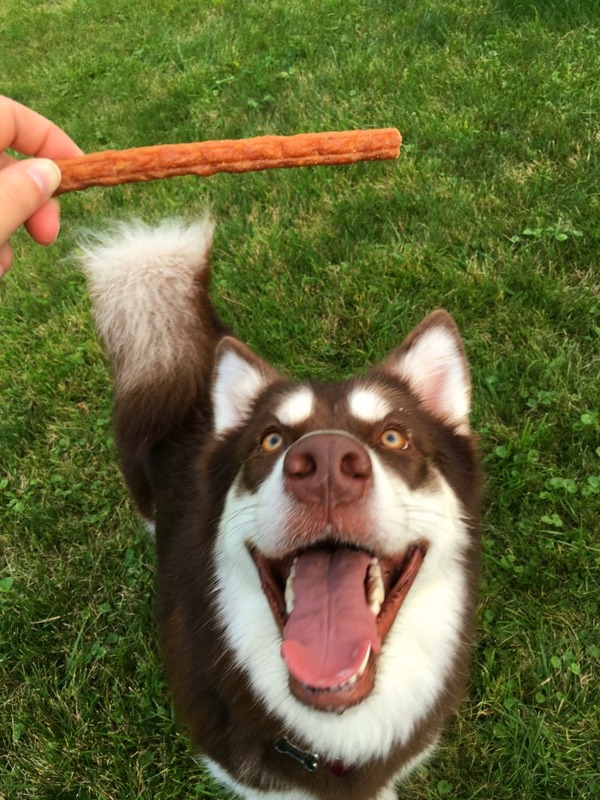 I love the idea of the dog treats for my pup. The fact that they are made in the US is a top reason for purchasing! I haven’t heard of this company. Thanks for the info. I’d be interested in knowing if the cleaner works in deterring re-soiling. Of course, my dogs are almost all seniors, so they can’t hold it as long as they used to. Love that these are all natural and doesn’t have a smell. Love that it’s natural. perfect for our dog. I am trying this based on the products being all natural. I love to help save the environment and not subjecting my animals to harsh chemicals. Your dogs are beautiful! I love the coloring! I also like natural pet care products, we do grain free/natural treats. And gluten free/grain free food. I love that the shampoo doesn’t have a strong smell. That’s always important when I buy doggie shampoo. Your dog is so beautiful! Never heard of this company but it’s great that there all natural. i love your dogs… they are beautiful. I absolutely love this! It’s organic and healthier for dogs and could easily make this at home yourself without the damaging chemicals. Love it! Sounds like great stuff from a great company. I will have to check out the stain and odor remover. I could sure use some of that in my home. I could have used some of that Professional Strength Stain & Odor Eliminator earlier today. Your pups look so cute! Looks like some great products. Love your beautiful babies! Love the use of natural products for my entire family including my pets.